With my kiddos finishing another school year I found myself trying to decide what to give their teachers as an end of the year gift. I raided my craft room and found a set of coffee cozy dies I purchased from Papertrey Ink a few months ago. PERFECT! I let the kids choose the papers and shape they wanted to use and I die cut all the pieces. They helped with the gluing, after I inked up all the edges of course. The flags on the straws were just hand cut to the size I needed to fit the Thank You stamp. The finishing touch was a little twine wrapped around the cozy and a bow on the flag. Simple! 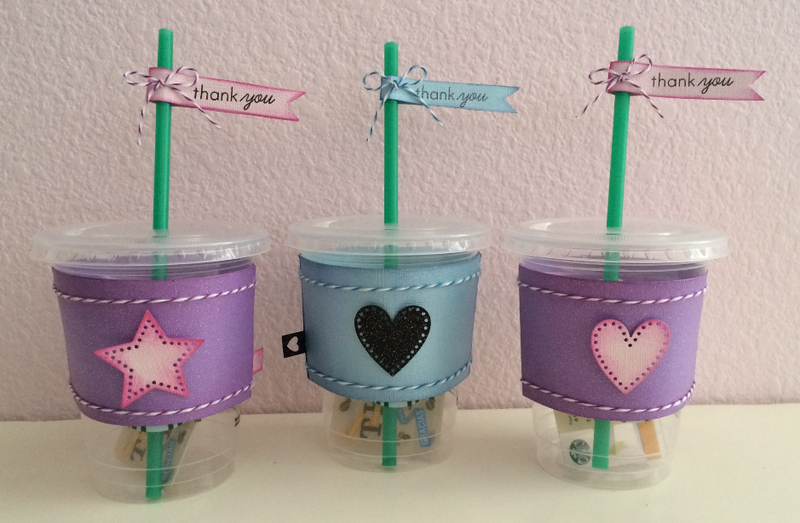 I purchased Starbucks gift cards and placed them inside the decorated cups. Super cute, super simple, and the teachers loved them. I will do this again whenever I need a quick gift. Hmmm, I'm thinking Christmas cups with felt would be adorable. Thanks for hopping by today. Please follow me and come back often for more inspiration.